During the past few weeks, I have been in and out of Rethymnon quite a lot, buying books and newspapers, visiting exhibitions, walking around the old Venetian Harbour, enjoying lunch or dinner, or just having a coffee. The heart of the old town of Rethymnon is just a 15 or 20 minute journey by taxi from Platanes, where I am staying, and even shorter by taxi. One afternoon this week, I called in to visit the workshop of Alexandra Kaouki (Αλεξανδρα Καουκι) on Melissinou Street, just beneath the slopes of the Venetian fortezza, where two of us received a warm welcome from Alexandra and her husband Vangellis Melidonis (Βαγγελησ Μελιδονησ). Alexandra is the foremost icon writer in Rethymnon today, and a recent exhibition in the Fortezza was a highly-acclaimed success. She began writing icons at the early age of 20, and proudly showed us her first completed work. 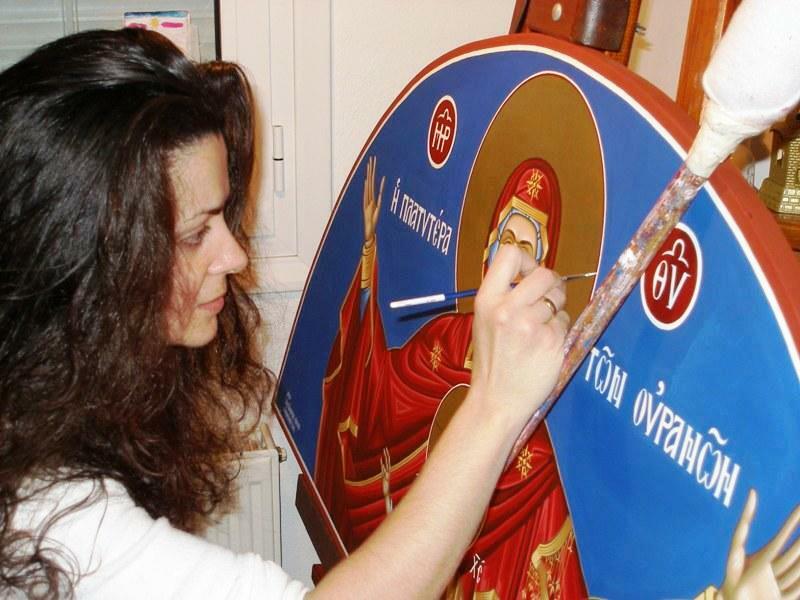 As we arrived, she was working at her easel on a new icon – indeed, we could see three icons were at different stages of completion. On a shelf beside her, a new icon of Saint Catherine of Alexandria is ready for the final touches, while on a second easel she is preparing the first stages of an icon of the Dormition. Vangellis explained how she had researched the tradition of this icon, looking at El Greco’s famous image of the Dormition, Byzantine icons on this theme, and looking at the Orthodox tradition about this event. Should there be one or three candles at the death bed of the Virgin Mary? Which apostles should be included in the icon? Should Christ be standing upright or be bent over his dying mother? Alexandra’s work is marked by its spirituality, simplicity, the expression of the figures and the brightness of her colours. She works throughout the day with care, faith and passion, all in the eye of passers-by and anyone who wishes to visit her workshop. 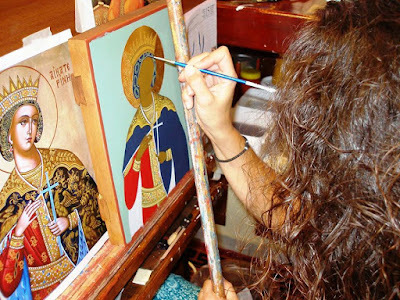 There she crafts icons using traditional Byzantine techniques and the faithful to traditions of the Cretan school. The raw materials she uses are of the highest quality, with natural and industrial woods, traditionally-prepared canvases, 22 carat gold leaf coating, mineral colours and tempera, which uses the yolk of an egg according to Byzantine and Orthodox traditions. Alexandra Kaouki was born in Le Mans in France in 1973. At the age of 20, she moved with her family to Athens, and there she took her first steps in the holy art of writing icons, and her first icon hangs on the wall above her in her workshop. She is self-taught, but has also learned at the hands of well-known icon writers in Athens from 1997 to 2000. She has lived in Rethymnon since 2006, and she took her first professional steps in 2007 when she opened her first art studio in Atsipopoulo. Since 2013, she has worked in the Old Town of Rethymnon, on a narrow street close to the slopes beneath the old Venetian Fortezza. 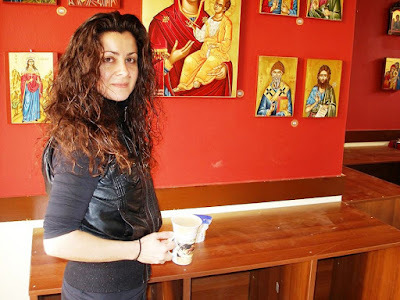 She took part in the Pan-Cretan Exhibition of Rethymnon in 2006, 2007, 2008 and also in the first, second and third exhibition of Hagiography (Iconography) of the Holy Metropolitan Church of Rethymno and Avlopotamou in 2012, 2013 and 2014. She also took part in the exhibition ‘Light, Art Eternal’ at the Zappeion Palace Athens in 2014. Her icon of the Four Martyrs of Rethymnon hangs over the desk of the Bishop of Rethymnon in his office. Her workshop also sells reproductions of her work, and some other Orthodox prayer materials, including prayer ropes and incense from Mouth Athos, and her own hand-made jewellery. We left with a small copy of her icon of the icon of the Four Martyrs of Rethymnon, two prayer ropes and a ring. Alexandra Kaouki’s workshop is at 22 Melissinou Street, 74100 Rethymnon, and is open from Monday to Sunday, 11 a.m. to 9 p.m. She accepts orders on a variety of theme with many dimensions. Visit her workshop here: http://www.alexandraicons.com, where you can see many of her works.